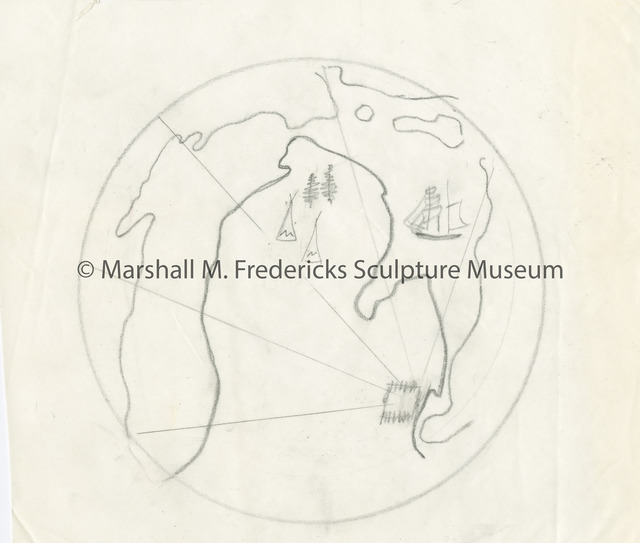 Marshall M. Fredericks Sculpture Museum | Sketch for "Seal of Wayne County, Michigan"
The event depicted on the seal is the signing of the peace treaty between Chief Pontiac (Ottawa) and Brig. General Anthony Wayne in 1796. Between the men stands a flag with stars in the middle. The treaty opened the land to be settled into what is now the city of Detroit. Included on the medallion are the phrases "Seal of the County of Wayne Michigan 1796", "We Produce", "We Defend", "Freedom of Man"' and "In God We Trust". The county was named for General Wayne. The bronze Seal of Wayne County hangs in the office of the Coleman A. Young Municipal Center in Detroit. It is also mounted above the Spirit of Detroit sculpture at the same location. According to the Joy Colby 1981 interview with Marshall Fredericks, he created this seal because there was no seal for the county when he designed the Spirit of Detroit. Fredericks, Marshall M., 1908-1998, “Sketch for "Seal of Wayne County, Michigan",” Marshall M. Fredericks Sculpture Museum, accessed April 19, 2019, http://omeka.svsu.edu/items/show/7605.